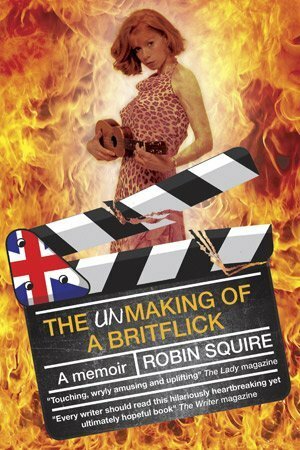 Britflick is my memoir – it reads like a diary and is absolutely true (as much as I’m prepared to admit!). It’s a screenwriter’s wryly real viewpoint of how one particular British film got made against a backdrop of cynicism, chicanery, muddle-headedness and a curious form of madness that appeared to affect almost everyone connected with it. The ‘real’ film starred a young actor who has since become internationally famous, as well as a splendid established actress. Yet even these two couldn’t save it. As in all the best stories, things don’t go at all as they should, and somewhere amid the cockups, misunderstandings and scream-inducing confusions I have a real-life encounter with an absolutely marvellous and wonderful and beautiful 1920s/30s/40s danceband-style ukulele-playing singer (that’s her on the cover), and came to not only be her roadie but creep out of my shell to join her in duets, tell jokes to blameless strangers and generally make even more of a fool of myself. There’s a bit in the book where we visit a preserved Victorian music hall in London’s east end after a gig. No one else is in there, and she does an impromptu ‘Marie Lloyd’ on the stage, her voice soaring as Marie’s must once have done in that same place. Sheer magic. In the end it magically bears witness to the great transformative powers of love and self-belief. Most sensible people, when struck by the idea of making a British film, would say ‘no thanks’ and go to the pub… This is a record of the heroic battle to make a film if you don’t have Brad Pitt or Hollywood on board… Lack of finance, amazing pieces of good fortune, followed by total disaster, are all part of this touching, amusing and uplifting story. The Making of a Britflick could easily translate, I believe into a successful movie about film-making. Contention on the red carpet for a BAFTA Award or a Hollywood Oscar – or both – would provide the epic comic ending which both the story and its two endearing and admirable characters richly deserve. Been there done that at least three times in the last five years! It really is astonishing to me that people even within the industry think so little of writers that the very idea of paying us for our services fills them with horror! Yet as we all know, without the writer there is no industry – be that film, TV, radio or publishing!